Sure, Mr. Roth said; on “hootenanny” nights, as he called them, anybody could sing a song or two, and this was a hootenanny night, a bitterly cold one, Jan. 24, 1961. And so Mr. Dylan took out his guitar and sang a handful of Woody Guthrie songs. The crowd “flipped” in excitement, Mr. Dylan later said. He had hitchhiked to New York from Minnesota, and after showing up at the Cafe Wha?, he mentioned to Mr. Roth that he had no place to sleep. So Mr. Roth later asked the audience “if anybody has a couch he can crash on” — and somebody did. An advertisement for Cafe Wha? featured a picture of a beatnik in beret and sunglasses and the slogan, “Greenwich Village’s Swingingest Coffee House.” Mary Travers, before she was the Mary of Peter, Paul and Mary, was a waitress there. Mr. Roth abandoned the club in the late 1960s, but it was started up again, after an interregnum as a Middle Eastern restaurant in the 1970s and ’80s, under the same name by a new owner, and it continues to operate. In 1959, someone told Mr. Roth about a garage that used to be an old horse stable on Macdougal between Bleecker and West Third Streets. You had to go down steep stairs to reach the dark, dank basement, which was bisected by a trough once used as a gutter for horse dung. Mr. Roth immediately recognized it as an excellent site for a coffee house — that legendary genre of cafe where, at least in the haziness of memory, hipsters smoked, sipped espresso and discussed Sartre. He spent his last $100 on a truckload of broken marble to make the floor, which he personally laid. He sprayed the walls with black paint to create the feeling of a cave. There were castoff chairs and candles in blue glass flickering on every table. Full occupancy was 325. At first, baskets were passed to pay the performers, who alternated all day long: conga drummers followed by impersonators followed by Appalachian balladeers. Mr. Dylan’s first regular job there was as a backup harmonica player during the day. Mr. Roth kept a famously tight lid on expenses. “By the time he got finished with a penny, you could no longer see the Lincoln on it,” the folk singer Dave Van Ronk once said. Mr. Roth’s downtown duchy was rich in entertainment history. On the folk singer Richie Havens’s recommendation, Mr. Roth hired Jimi Hendrix, who in the mid-1960s called himself Jimmy James as the frontman for a group called the Blue Flames. The Flames played five sets a night, sometimes six nights a week, at Cafe Wha? for little more than tips. For two months in 1967, a then-unknown Bruce Springsteen brought his band the Castiles to the club to play afternoon sets for teenagers. Louis Gossett Jr. sang folk songs there before deciding to pursue acting full-time. Mr. Pryor told jokes there, and Mr. Roth became his first manager. “I was in the center of the scene there — all you had to do was carry an empty guitar case and girls would follow you,” Mr. Roth was quoted as saying on the website of the rock band Van Halen, of which his nephew David Lee Roth is the frontman. There were, to be sure, small problems, like the time in 1961 when the police filed charges against Mr. Roth for allowing an unleashed French poodle to roam the club. (It turned out to belong to a waitress, and the charges were dropped.) Like other Village clubs, Cafe Wha? was occasionally fined for selling food and providing entertainment without a cabaret license. After Mr. Dylan was late for performances three times in a row, Mr. Roth fired him. In 2012, David Lee Roth came back to play Cafe Wha?, which he had loved to visit as a 7-year-old, with Van Halen. It looked pretty much the same as he remembered it. Today, the Café Wha? showcases amazing talent with the three greatest house bands in New York City. Monday night features a variety of performers - check our calendar for details. Disfunktion takes on Tuesdays with soul music, radiating the roots of R&B and Funk. 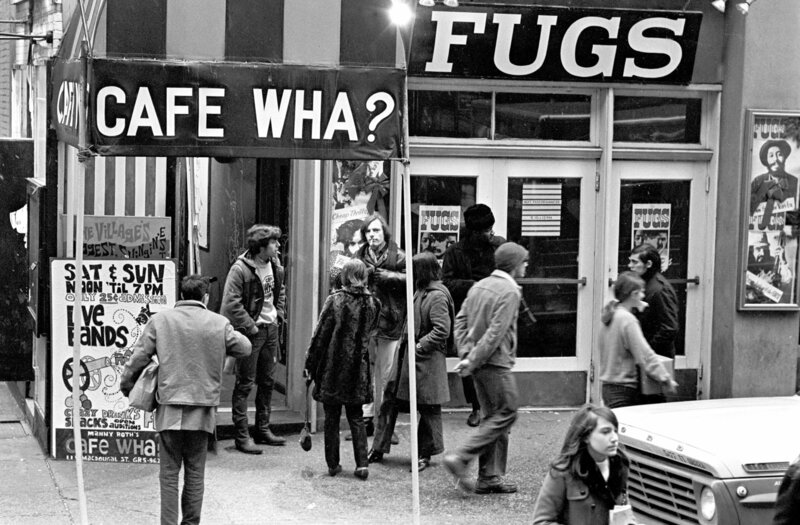 What about the Café Wha? House Band? Wednesday thru Sunday they will satisfy your every need for sound, hitting on all styles of music; Motown, Reggae, R&B, and Classic/ Alternative/ Modern rock. Every night at the Café Wha? is a party. You never know which famous musician will show up and sit in with one of these incredible bands. The New York Times raves, “Power house talent - you'd be hard-pressed to find a more exhilarating evening out." The Café Wha? is a stop you have to make whether you are living or just visiting New York City.